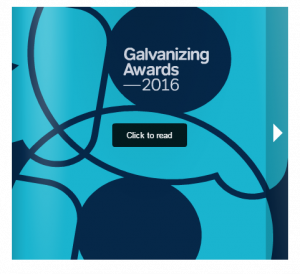 The judging panel of the 2016 Galvanizing Awards consisted of Jan-Carlos Kucharek, Matthew Wells, Andrew Matthews and Iqbal Johal, with the winners announced at the ceremony on 30th June at the Royal Aeronautical Society, 4 Hamilton Place, London. The 2016 GAGAs were marked by a record attendance at 4 Hamilton Place, with its chic terrace overlooking Hyde Park Corner. An extensive mix of entries kept the judging panel on their toes – galvanized nodes rubbed shoulders with steel for energy from waste plants. 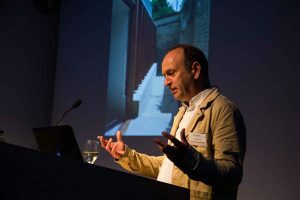 Hugh Strange focussed on his passion for unfinished materials with his introductory presentation. Direct contact with tangible materials, weathering, material compatibility and softer aesthetic were all mentioned as important design considerations for his practice. The first prestigious galvanized watering can went to Sutherland Hussey Harris’ Edinburgh Sculpture Workshop: Creative Labs, the architecture award winner. The elegantly detailed concrete, brick and galvanized aesthetic realised on a limited budget provides a new space for budding and professional artists alike. TSP, the engineering award winner for Suffolk Energy from Waste Facility, meets exceptionally high standards in all aspects from operation, performance and emissions, the building also provides facilities for the local community to enhance education and understanding of the role of waste management. Hudson Architects’ strategic interventions on the existing campus of Norwich’s University of the Arts was recognised for its glimmering, folded galvanized sheet staircase that won the detail award (see architectural steelwork). Encouraging greater interaction across the various disciplines taught within the building. The duplex systems award winner, DunnettCravens’ Windhinders, are the minimum intervention that allows a windblown public space to be occupied again. Carefully detailed canopies pared down to a minimal composition of tapered columns, gutter beams and frameless glass integrate into a Dutch cityscape. While the Innovation winner brings the outdoors indoors. Galvanized steel plays a crucial role in creating the required identity for Coffee Ground by Kiwi & Pom, a new artisan café concept for Wyevale Garden Centres. The project included an interior design, brand identity, art direction and graphic design. The concept takes a symbolic structure close to the heart of every gardener and creates a distinctive landmark for the client. 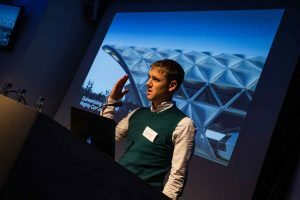 Three projects were highly commended, the stand out – Crossrail Place – recognised for interlacing a timber latticed roof which cantilevers out over the waters of Canary Wharf. 564 galvanized nodes, many of them unique, enable 1418 glulam beams to be connected to form a 30 m arched roof. Learn more about the construction awards or click below for more information about the GAGA 2016 winning projects.